1973 saw the inception of Jaffer Bhai’s Delhi Darbar at Grant road, Mumbai. With the passion in his heart and hands lead to the best culinary art. Jaffer Bhai’s philosophy was to be a perfectionist from start till the end. He believed in identifying the right ingredients for quality product. An avid chef for whom art of cooking is what he breathes for. Personal touch is of prime importance thus participating in kitchen for the menu prepared is like a second nature to him. 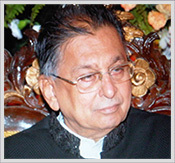 Jaffer Bhai’s key areas to produce quality products are: In-depth Knowledge of raw material are of great importance as that defines the final product, and since jaffer bhai has been in the industry for over 50 years his judgment is impeccable for selecting the quality of the raw material. The freshness of the product used characterize the quality of the product, thereby determining the sumptuous cuisine. The meat quality is so good that till date no other restaurant is close to it. The “Biryani King of Mumbai”, Delhi Darbar’s Jafferbhai Mansuri makes the best biryani and is the only restaurateur who can cook every item of food on the menu. Compromising the quality or taste is not there in Jaffer Bhai’s ingredients.